2. Rub the mushrooms with some oil and sprinkle sea salt and pepper over top. 3. Place in a baking dish and roast for 25-30 minutes. 4. Meanwhile, prepare the pesto. Make sure to rinse off the basil leaves and dry really well. 5. Lightly toast the walnuts. We like to put them on a small baking sheet and bake at 375 for around 5 minutes, until lightly toasted. 6. Combine all of the pesto ingredients in the food processor and pulse until finely chopped. 7. Set the pesto aside. 8. Next you’ll prepare the salmon. Season the salmon with sea salt and pepper. 9. Heat a skillet with some oil. Once hot, add the salmon. Squeeze lemon juice over top. Cook on the first side for about 4-5 minutes. Then flip and cook on the second side for another 4-5 minutes, until cooked in center. Serve onto 2 plates. 10. When the mushrooms are cooked, remove from the oven and slice thinly. 11. Toss the mushrooms with around 1/4 cup of the pesto. Divide the mushrooms between the two plates, pairing with the salmon. 12. 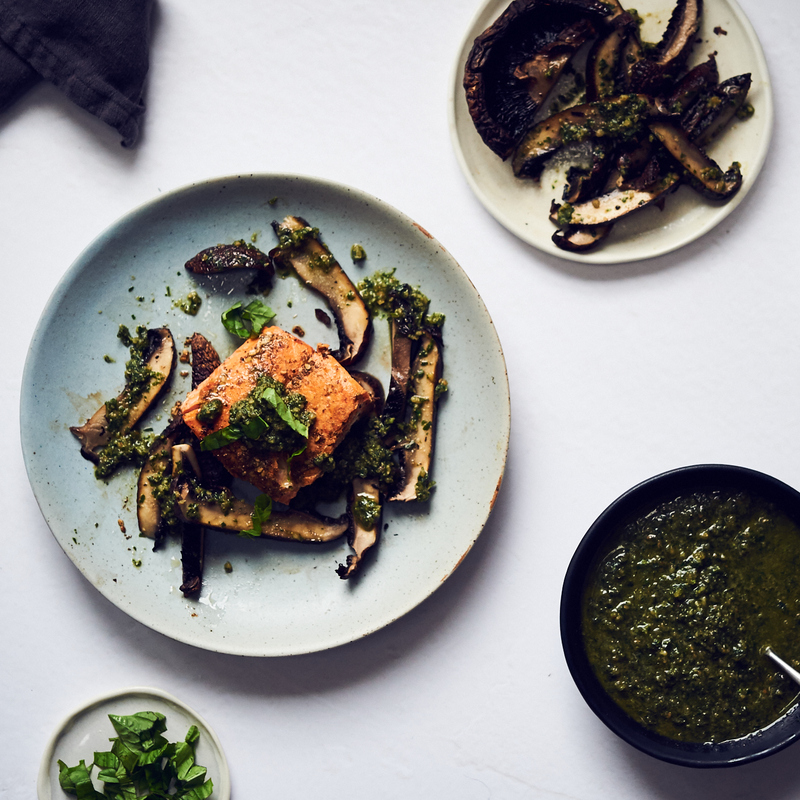 Place some extra pesto on top of each pieces of salmon. 12. Extra pesto can be saved in the fridge. Store in a jar for up to a week.